This is Green Ranger Year One! 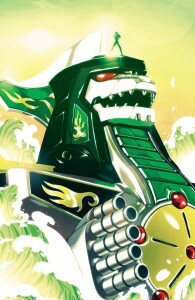 The Green Ranger’s addition to the team has brought new instability and uncertainty to the Rangers. 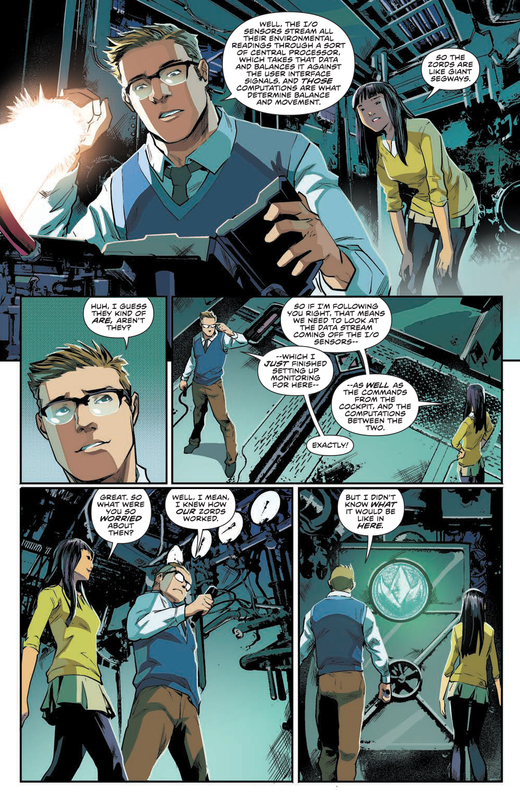 With remnants of Rita Repulsa’s control still stirring in the back of Tommy’s mind, he must confront the fact he may be more of a danger to his new team than a help. 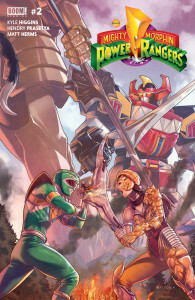 As Rita plays the heroes against each other, her ultimate plan begins to take form, and vengeance for the Green Ranger’s betrayal will be unleashed on Angel Grove. Also featuring a Bulk & Skull short story by Steve Orlando (Midnighter) and artist Corin Howell that puts the pair on the ultimate mission to impress Kimberly and Trini! I’m not going to say that I’ve been a huge fan of the Power Rangers. What I will say is that when my son took to watching their show instead of watching Barney, I considered it one of those parental wins you hear about but seldom experience. While the dialogue was often painfully cheesy and full of saccharine, at least there was some decent martial arts fighting to watch. It was with this sense of nostalgia that I approached the series from Boom! when I first heard about it. 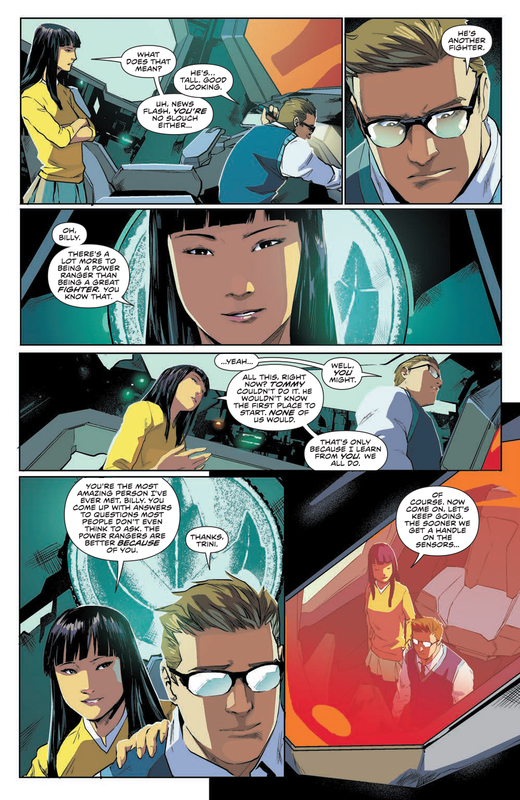 I read the zero issue, and was surprised that the writing seemed to be taking the story up a notch when compared to the television series which was aimed at young kids. While there were no action sequences in that introductory issue to go by, the writing alone gave me some indication that this series was being taken a little more seriously than it could have been. Then issue #1 came along, and the trend continued. Still none of the trademark Power Rangers fighting, but the story was progressing. Now in issue #2, that story is starting to unfold… and I got my fight! 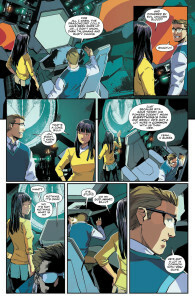 Tommy, the Green Ranger, is the central figure in this series. 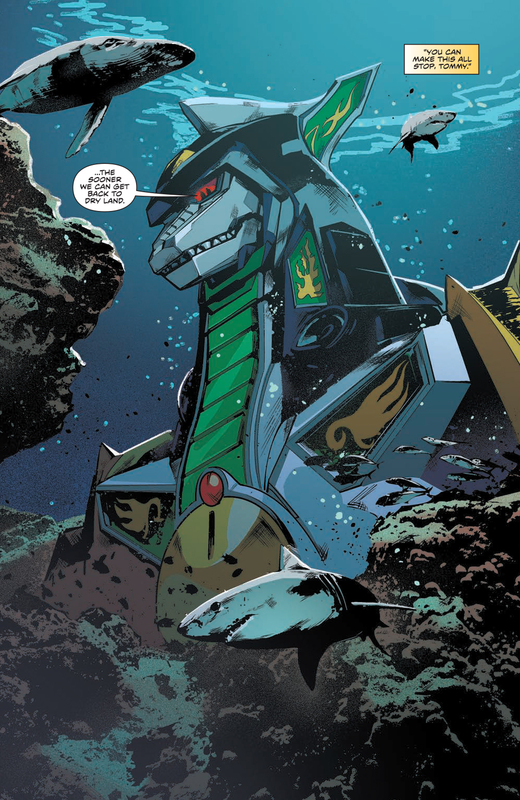 Viewers of the old series will remember that the Green Ranger was originally introduced as a bad guy, given his powers, the Sword of Darkness, and the Dragonzord by Rita Repulsa. 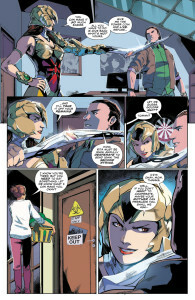 Her goal was to have Tommy use these tools, along with his unparalleled martial arts ability, to defeat the Rangers. 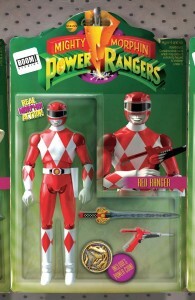 He almost succeeded, but in a battle with Jason, the Red Ranger, the Sword of Darkness was destroyed, thus (really? “Thus”?) 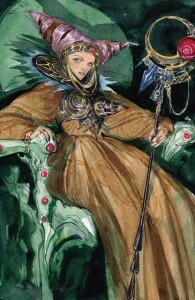 breaking Rita’s spell over Tommy and ending his reign of terror before it had really gotten going. Now, being a good bunch of kids, the Power Rangers (Jason, Kimberly, Zach, Trini, and Billy) come to understand that Tommy was under a spell. It happens. So they take Tommy in as one of their own, and over time he becomes a legendary Power Ranger. This story comes somewhere in the middle of all that. Tommy has just begun his way down the path of the hero, still trying to overcome the effects of Rita’s spell on him. One of those effects is the ghostly appearance of Rita, visible only to him, still trying to manipulate Tommy. At this point, I’m not sure if this is really Rita, or if it’s only an impression of her left behind by the mind control spell. What I do know is that Tommy’s having a tough time reconciling his actions as Rita’s puppet, against the Power Ranger he aspires to be. 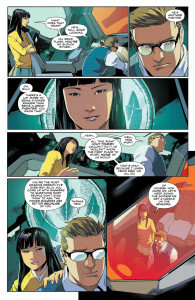 Using that as her foot in the door, psychic ghost Rita is picking away at his resolve, doing her level best to convince Tommy that as soon as the other Rangers find out about his past, find out that she’s still in his head, they’ll turn on him without a second thought. As issue two opens up, another of Rita’s agents, Scorpina (yeah, sorry… can’t really do anything about the names. They’re cannon), has approached Tommy in his home and is making threats against his mom. Scorpina will attack her unless Tommy gives up the Power Coin needed to control the Dragonzord. Tommy teleports them both to a remote area, and with the words, “It’s Morphin’ time!” we have our first real fight. Overall, I’d say that this series is still going to be geared more toward younger readers, but this time around it’s going to be less of a chore for the parents that might be interested in reading along. The dialogue is far and away better than what we had to suffer through on the show, and the story seems to be stretching out into something less linear and more layered. We’re still not recreating the works of Shakespeare, but we are definitely getting treated to a story that builds on the source material from whence (come on… “whence”?) it came. Along with a more interesting story, the characters are getting treated a little better, becoming much more than the two dimensional stereotypes they were in their humble beginnings. Now… the action. This is what’s going to be the x factor for this series. It was the defining trait of the television series, so it’s only right that it play a big role in the presentation of the comic. In the show, everyone brought something to the table. Pretty much every episode had one major fight scene, usually starting out with the Rangers fighting in their civilian guises until things got too rough and it was declared “Morphin’ time!” The martial arts action was dynamic and fast-paced, if a little watered down for the kids, with the Rangers being limited to body strikes that targeted a prominent weak spot on Rita’s (and subsequent evil doers’) goons. That kind of action may be a little tougher to deliver in a comic book format, where the scope is limited to the panel and doesn’t have the benefit of motion. The action in this book wasn’t bad, but it did come across as a little flat. I’m not sure if it would benefit from opening the panels up more, to utilize a larger view, or if it’s just a matter of finding the angles needed to convey the motion that’s missing. It can’t be an easy thing, but it can be done… check out some of the Dragonball Z manga out there. 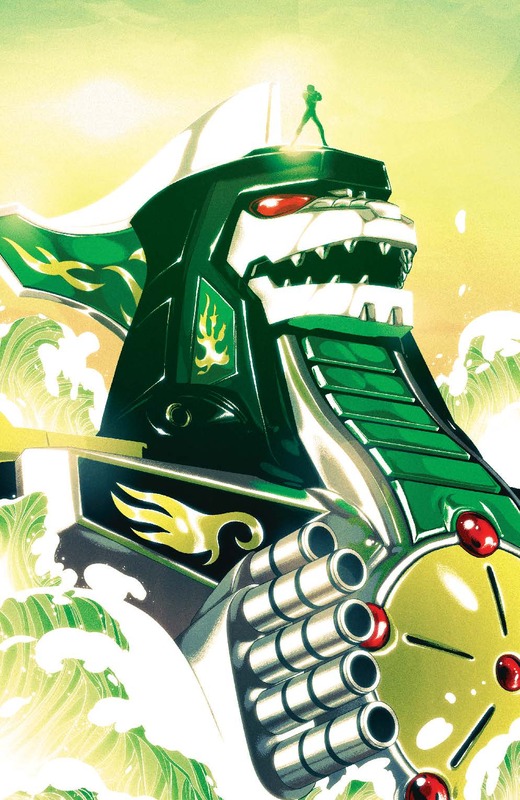 Overall, The Mighty Morphin Power Rangers is almost a cultural icon. It’s been copied, by itself and by others, more times than I can count, and with a movie planned down the road the property is ripe for resurgence. I’m glad that Boom! jumped to take the chance. 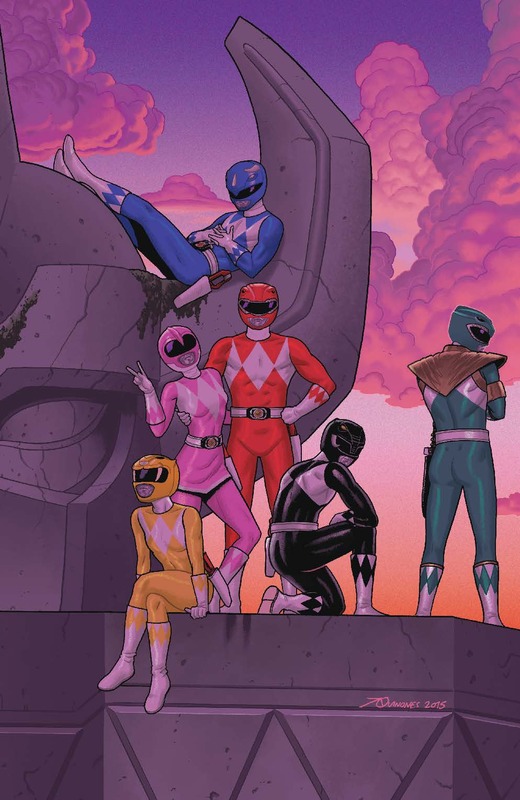 Given some of their other franchise work with movie and TV adaptations, the Rangers could very well Morph themselves into a solid hit of a comic series.